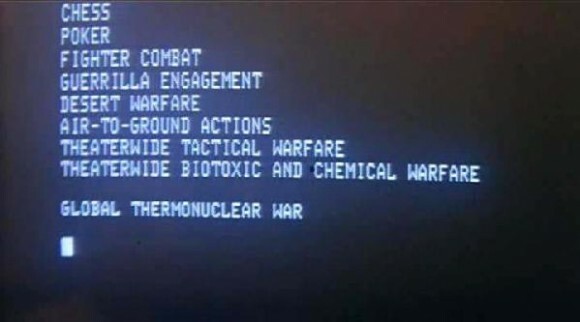 I said I’d talk about thermonuclear weapons at some point. We have now reached it. So you’ve got your fission weapon designs which are coming up on seventy years old now. They make a pretty loud bang, can seriously mess up a city if detonated over one, and refinement of the designs over the years have allowed us to squeeze ever larger booms out of the same amount of fissile material. Eventually, though, you run up against hard physical limits enforced by the fission reaction itself. Past a certain point you’re converting the vast majority of fissile material inside the bomb into explosive energy and further attempts to increase the bomb’s efficiency have drastically diminishing returns. However, modern nuclear weapon delivery systems – ICBMs with MIRV warheads – mean warhead weight is at a premium. It’s all very well to physically lug your fission bomb over to the target city in a WW2 bomber, but if you want to strike your enemies with genocidal death weapons launched from the other side of the planet you need something even lighter than even the most efficient fission weapon designs. 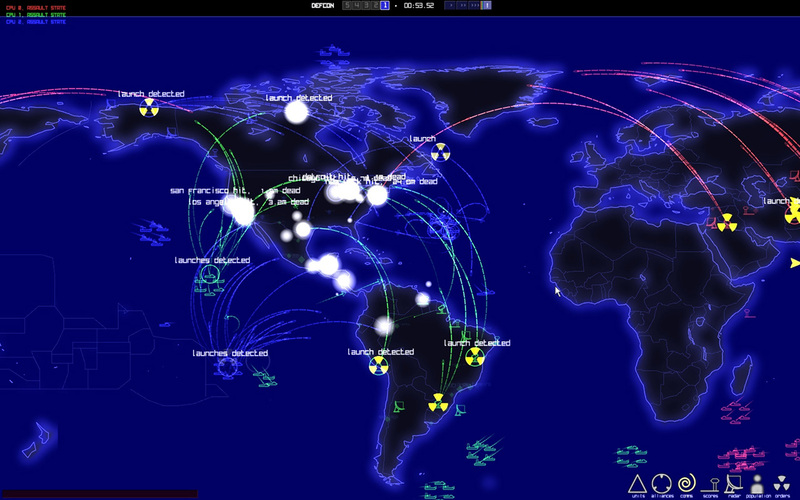 This is where thermonuclear weapons come in. Thermonuclear weapons are also known as fusion bombs or hydrogen bombs, and that’s because they rely on fusing together isotopes of hydrogen to produce most of their energy instead of a simple fission reaction to split atoms in a fissile material. You may be familiar with the nuclear fusion process as the thing that goes on inside the heart of a star to give us the heat and light we need to survive on Earth, as well as something that alternative energy researchers are very interested in as the possible future of large-scale power generation on this planet. Fusion can liberate a tremendous amount of energy from a very small quantity of fuel. Unfortunately for the energy researchers the pressures and temperatures required to naturally induce fusion are basically those found inside the core of a star, and are understandably difficult to reproduce in a stable form inside a fusion reactor. This is why fusion power was just around the corner twenty years ago, is just around the corner today, and will be just around the corner in twenty years time; achieving steady-state fusion requires materials and technologies that haven’t been invented/perfected yet like room-temperature superconductors, and while these technologies always seem tantalisingly within reach they never quite seem to materialise. I’m digressing here, though. We’re interested in how fusion bombs work, not fusion reactors, and the cunning thing about the fusion bomb is that while you cannot yet reliably reproduce a star-like environment over a period of time appreciable to a human being (say five minutes or so) you can use a fission bomb as a first-stage to recreate the pressures and temperatures required for nuclear fusion for a very, very brief moment of time. As we saw in the first nuclear weapons post, given the runaway nature of nuclear reactions that one moment is all you need to make a very big bang indeed. You have a fission bomb primary which works exactly as described in the original nuclear weapons post, so there’s no mystery there. What we’re interested in is the fusion secondary, although the interstage separating the two deserves a brief mention; that has to correctly direct the energy and radiation released by the explosion of the fission primary towards the fusion secondary in such a way that it successfully triggers fusion. If you don’t build your interstage correctly you get a “fissile fizzle”, which is just a small fission explosion and nothing else since the secondary stage didn’t trigger. Sadly I can’t tell you exactly how an interstage works because – as you’d expect – the details are highly classified. 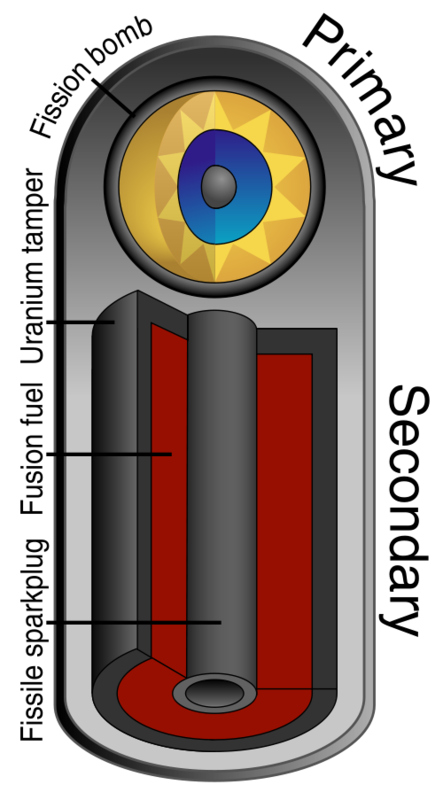 The secondary itself is a column of fusion fuel contained within a tamper. The tamper works just like the tamper in a fission bomb: it is a very dense material such as uranium which serves to contain the expanding energies of the fusion explosion for just a few microseconds longer than they otherwise would, but which nevertheless makes all the difference in amplifying the power of the nuclear explosion. Inside the fusion fuel is a uranium rod which acts as a fission sparkplug; because it’s rod-shaped it does not constitute a critical mass until compressed by the detonation of the fission primary, at which point it itself will go nuclear and further heat and compress the fusion fuel to the point where it starts to fuse. The fusion fuel is a heady mix of deuterium and tritum formed by lithium deuteride. The flood of neutrons created by the chain reaction in the fission primary bombards this lithium deuteride, splitting the lithium component into helium-3 and tritum. Tritum is one of the isotopes of hydrogen which can undergo nuclear fusion, the other being the deuterium component of the lithium deuteride. The explosion of the primary bookended with the now-nuclear fission sparkplug compresses the tritum and deuterium together, forcing them to fuse together into helium-4. Incidental byproducts of this fusion reaction happen to include a neutron, which can then go off and split another lithium atom, and 17.59 MeV of energy. The heat provided by the fissionable bomb, tamper and sparkplug is key to the nuclear fusion reaction, hence the term “thermonuclear bomb”. One of the interesting things about the fusion reaction inside a hydrogen bomb is that it creates very few harmful radioactive byproducts, with the main result of the reaction being a crapload of ionising radiation that is reflected back into the bomb core to increase the power of the explosion. If this radiation was released it would certainly kill anything unlucky enough to be in the blast radius but it wouldn’t persist, making a fusion bomb far cleaner in theory than an equivalent fission bomb. Unfortunately the two-stage design of fusion weapons means that they include fission bombs by default, and furthermore the fissionable material providing the heat and pressure for the fusion reaction means that it’s still going to scatter radioactive fission fragments over a wide area, making the typical hydrogen bomb just as bad as any fission weapon in terms of irradiating the blast zone. Designs which replace the fissionable uranium tamper with another dense, non-fissionable material such as lead do exist, and while they reduce the yield of the bomb by about half they’re also far “cleaner”. These are the fabled neutron bombs, which are supposed to kill people but leave infrastructure intact1, and they do this via the spray of neutron radiation released by the fusion reaction described above. How much more efficient are thermonuclear weapons compared to common-or-garden fission bombs? As a rough guide, the explosive power of a fission bomb ranges from a few kilotons for the most basic, primitive types (Fat Man and Little Boy) to about half a megaton for a modern fusion-boosted design – that is, a fission bomb with a small amount of fusion material mixed in to boost the yield. By contrast thermonuclear weapons start at about half a megaton and work their way up from there. The largest nuclear weapon ever detonated was the fifty-megaton Tsar Bomba, which actually added a third fusion stage to the fission primary and fusion secondary described here to achieve its obscene yield, but Tsar Bomba was a product of Cold War willy-waving and was subsequently deemed overkill for the practical use of nuclear weapons: destroying cities. Most modern thermonuclear warheads have a yield range anywhere up to about 1.5 megatons, this being more than sufficient to do the job as long as your ICBM targeting is good enough. Nuclear warheads are designed to explode above cities, not on them; this allows the heat and the shockwave to flatten a wide areas below them rather than having their explosive energy soaked up by having to travel through buildings, and if you do it like this it turns out you simply don’t need a very big bomb to devastate a city. 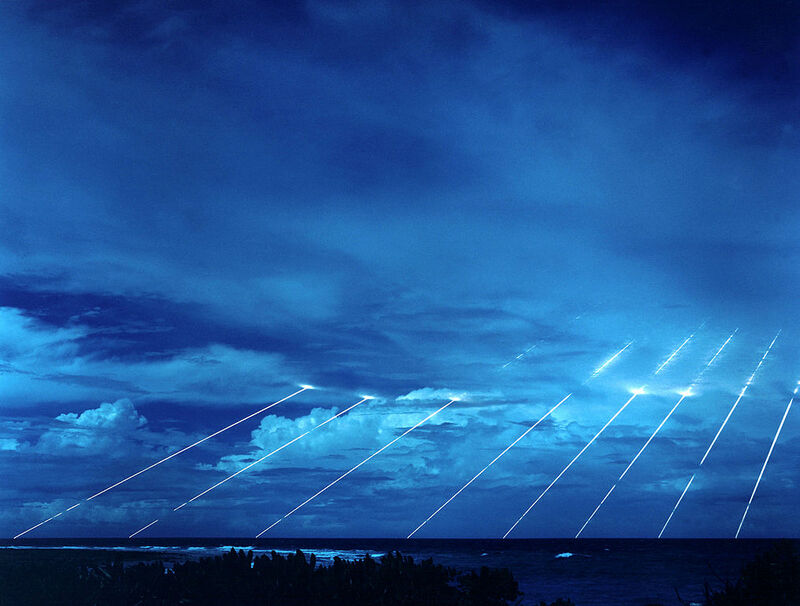 Also many small explosions are more efficient in terms of distributing energy than one big one2, so scattering a series of smaller MIRV warheads across a large area is a much better way of doing the job. Well, that was educational. I don’t know about you, but I’d managed to go through 28 years on this planet without knowing just why these nightmare inventions were called hydrogen bombs. And now I do. Isn’t learning fun? The actual effects of the explosions on a civilian population are somewhat beyond my purview, but if you really want to be depressed for the rest of the day you could do worse than watch the War Game, a sixties mockumentary that was banned from broadcast for twenty years because it was “too horrifying for the medium of broadcasting”, and also Threads, the 80s equivalent. 1. Although they’d still do a fair bit of damage thanks to having a fission bomb jammed in the top. 2. The power of the explosion diminishes exponentially with distance in accordance with the inverse square law, which is another reason why Tsar Bomba was a stupid sabre-rattling exercise. Tagged fusion, fusion bomb, hydrogen bomb, nuclear weapons, thermonuclear, would you like to play a game?